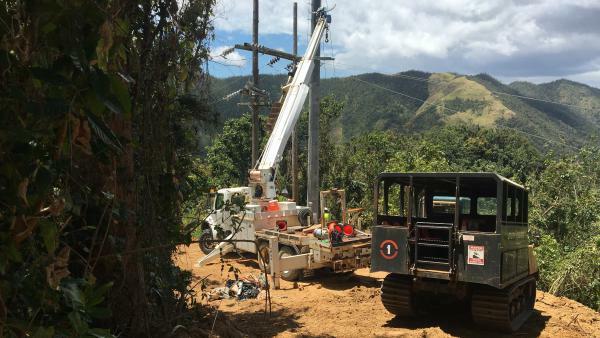 Contractors working to restore power in Cayey, Puerto Rico, last week, the same region where a falling tree interrupted a main transmission line Thursday, plunging 840,000 customers into darkness. Officials from the island's electric utility company – PREPA — said the accident occurred in the region of Cayey, where crews were working to restore power to people still waiting nearly seven months after Hurricane Maria. Increasingly, that work requires clearing away heavily forested mountainsides to gain access to the large utility poles that carry transmission lines from one mountain peak to the next. It was during that kind of work that a tree falling toward the ground made contact with the power line instead. One worker, employed by a PREPA subcontractor, was hospitalized with burns to his hands, though officials said he was in stable condition. It would seem remarkable that a single tree could plunge more than half of the commonwealth's population into darkness. But it was so, and PREPA even tweeted a picture of the tree. Karla Iglesias, an engineer who has worked on Puerto Rico's electrical grid, said it has everything to do with the fact that the line the tree made contact with – known as line 50900 — connects two of the island's main power plants, Palo Seco and Aguirre. "This line was coming out of one generation plant and connecting to another generation plant. So when the tree hits that line, it's going to interrupt a major flow of current," Iglesias said. "Imagine that you have those Christmas lights. If you break the first one, the rest aren't going to work. It's going to break the circuit." PREPA officials said they were working to restore power as quickly as possible, and some communities had already come back online by late afternoon. But officials said full restoration could take as long as 11 hours. In some places that have had their power back for months, like the capital, San Juan, the outage was a humbling reminder that the restoration is not yet complete in more remote parts of the island, and that one mistake still has the ability to ripple back to the island's most populated centers. In places that only recently got their power back, the outage was a frustrating, if not totally surprising, setback. "When you went five-plus months without power," tweeted Jozyel Manuel Rivera, "a few more hours or a day isn't going to kill you."